This has been a wonderful holiday week and I certainly hope you all had a great time as well. I did spend a little time on a hot cider based cocktail, with much emphasis on the “little”. Basically I made some mulled cider using a great organic pressed apple cider made locally and some standard mulling spices (orange peel, cinnamon, cloves, allspice, star anise). Once I had that I proceeded to drink most of it cold on its own. However, keeping in mind that I wanted to do a bit of a tasting I saved about two cups with which to experiment. 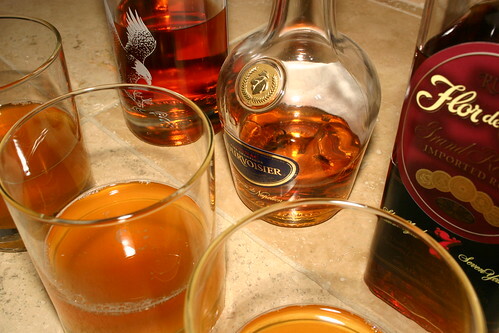 I filled each of my tasting glasses with four ounces of hot cider and one ounce each of the following spirits: Eagle Rare Bourbon, Courvoisier VSOP Cognac, and Flor de Cana 7yo Dark Rum. This is nearly identical to the egg nog showdown but I felt that these spirits would play best with the mulled apple cider, although I did contemplate trying some apple jack. However, I was dissuaded when I read online that someone had tried that combo and found it much too apply. Then I set out to taste each of them. The first thing you notice before you even bring your nose near the glasses is the amazing aroma of hot cider and dark spirits. It filled the air of my kitchen and was really incredibly pleasant and warming. The tasting results are very similar to those of the nog tasting. The bourbon is my hands down winner because it retains the most flavor when combined with the cider. You still pick up the smokiness from the barrel aging and the additional spiciness of the bourbon is perfect. The brandy adds a nice alcohol warmth, but you lose most of the flavor to the spices in the cider. Finally the sweetness of the rum helps to maintain a sweeter final product than the brandy or bourbon but loses the most flavor. I found the rum to be nearly undetectable. It was quite obvious that there was liquor in the cider, but I don’t think I would have been able to nail down exactly what in a blind taste test. Having tried these three I noticed I had exactly 1/2 cup of cider left, so to change things up I poured in an ounce of Plymouth gin. Let’s be clear, this was not a good experiment. Were I in a cartoon lab this creation surely would have exploded and left me with a face blackened by soot. This being the real world I was instead left with an odd, at best, aroma and a flavor to match. Don’t waste either good cider or gin in trying this one, you won’t be pleased. Overall I’m fairly pleased with the results, but I do have a small confession to make. I don’t really like hot drinks. I hate coffee, except in things (cake, ice cream, etc), don’t much like hot tea, and rarely drink hot chocolate. Although I have been known to have a Coco Loco (Hot Chocolate and Peppermint Schnapps) while snowmobiling. Speaking of which, they’re really quite good, give it a go next time you’re wanting something warm and boozy. That said a hot cider drink just seemed appropriate for the holidays. It’s cold outside (at least it is here), there is some snow on the ground, people are going nuts shopping, just seemed right. But sadly due to my dislike of hot beverages I didn’t do much with this potential canvas. There is hope however! You, the Cocktail Hacker readers, can save me. Post up suggestions or tried and true recipes for hot cocktails. I’d like to hear what you all like. Perhaps a long expedition in very cold weather would cure this aliment. Since I’m from Wisconsin and got to spend holidays in northern Minnesota (yay -45 degrees) – this might be the way to cure the difficulty. That said, the cure may be worse than the problem.